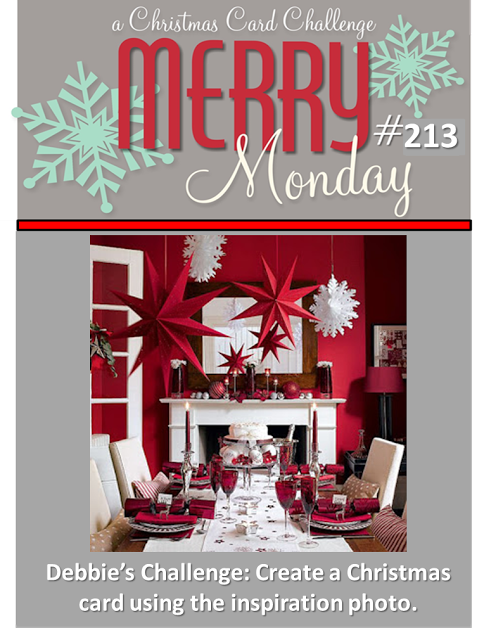 Merry Monday one and all, we have a new Merry Monday Christmas card challenge this morning. 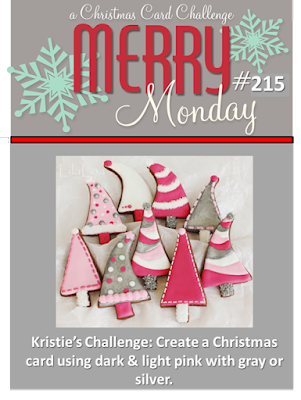 This week Kristie challenges us to use dark & light pink with gray or silver on our Christmas card. I have been playing around with Distress inks the past little while and being as I sometimes struggle with colour challenges so I though I would try some ink blending for this challenge. I heat embossed a music background in platinum. I die cut these stitched snowflakes but left them pieced into the paper and added colour to them using 4 different shades of pink. 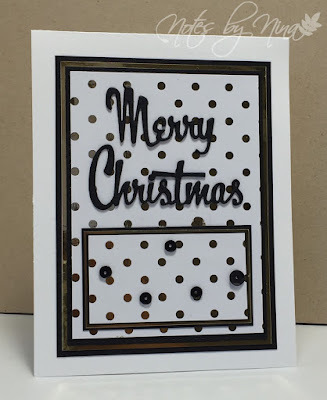 I created the matching platinum dots by melting embossing power and dropping it onto my craft mat. I heat embossed the sentiment onto black cardstock and popped up. I finished with a thin edge of pink around the center panel. Supplies: White and Back Card Stock, Stampendous - Music Score, Verve - Christmas in the Air, Lawn Fawn - Stitched Snowflake. 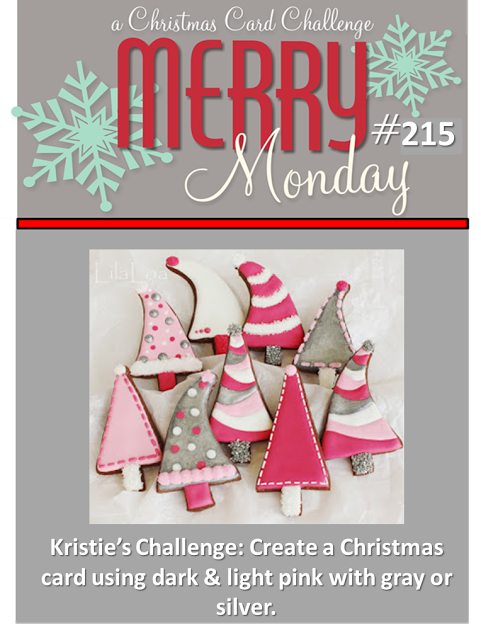 Head over to the Merry Monday blog to take a look at the Challenge and play along. 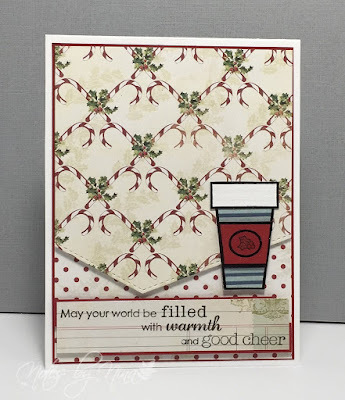 Should I admit how lazy I was with this card..Happy Saturday everyone and welcome to a new challenge for The Challenge.Lesley has swapped out the Masculine inspiration challenges for Christmas and this image is adorable. I received this super cute designer paper pack in the mail a couple of weeks ago. I loved this little scene already set up for me, karma I say. I also played with a new Echo Park stencil and added some texture with some paste. I sprinkled a little clear glitter on while it was still wet. I heat embossed the sentiment and popped it up with foam tape. The center panel is also popped up for a little extra dimension. I love the the scalloped bottom layer too.. who can resist a pretty plaid. 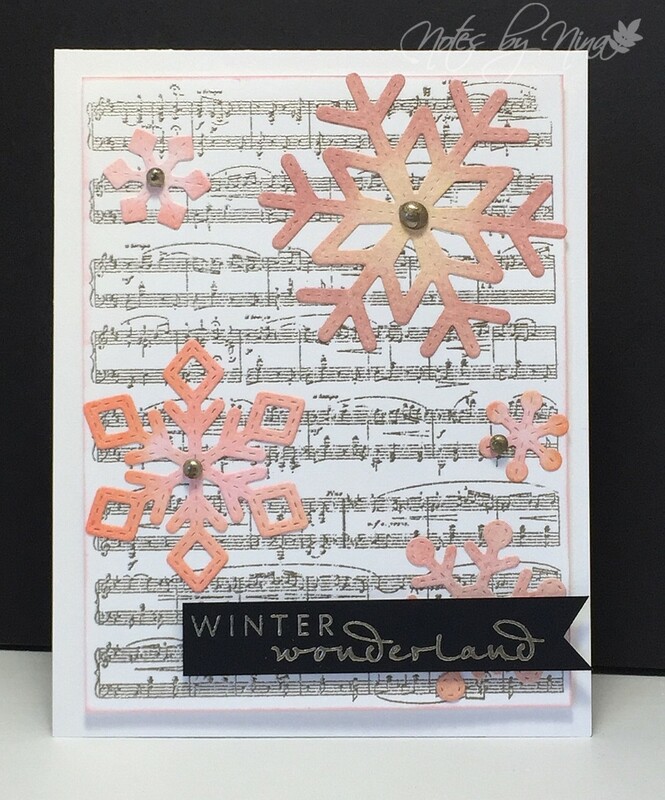 Supplies: White card stock, Designer Paper - American Crafts, Simon Say Stamps - Circle Saying, Echo Park - Holiday Snow Fall, glitter. 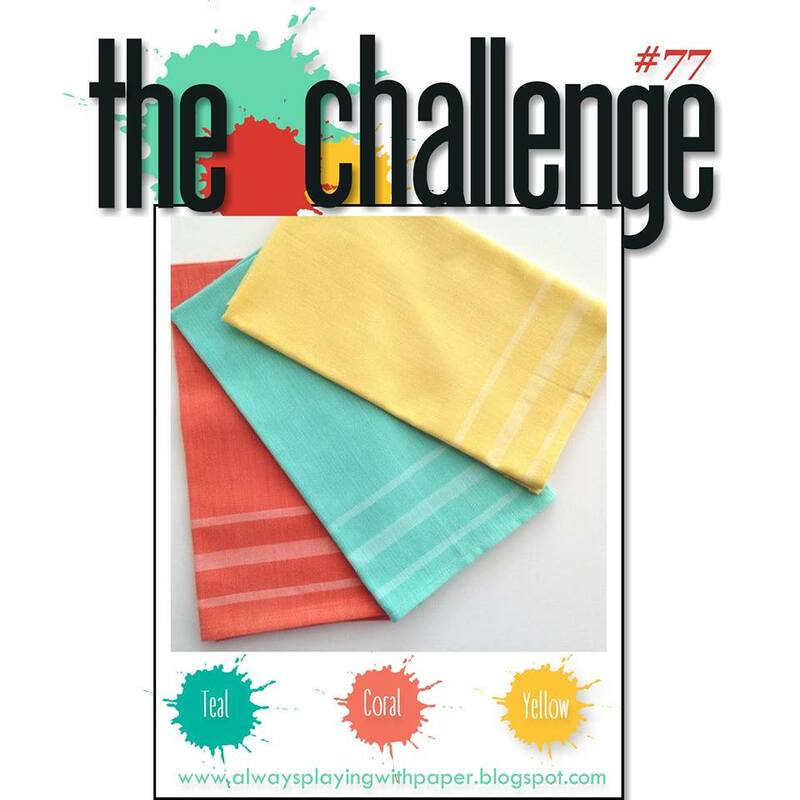 The design team loves to hear from you, pop by The Challenge blog to play along and see the inspiration. 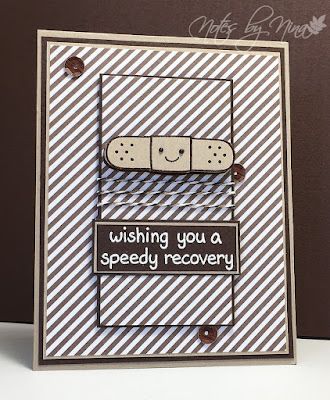 This was a quick card to go along with the Speed Recovery, my In-laws are braving the battles of getting older and the health issues that arise along the way. I used my stitched die cuts to create a frame from DP then popped up the inside piece with foam tape. Card in had it goes it a 3D effect. I stamped the sentiment on the top panel then heat embossed the flowers and vase a couple time and used foam tape for dimension. 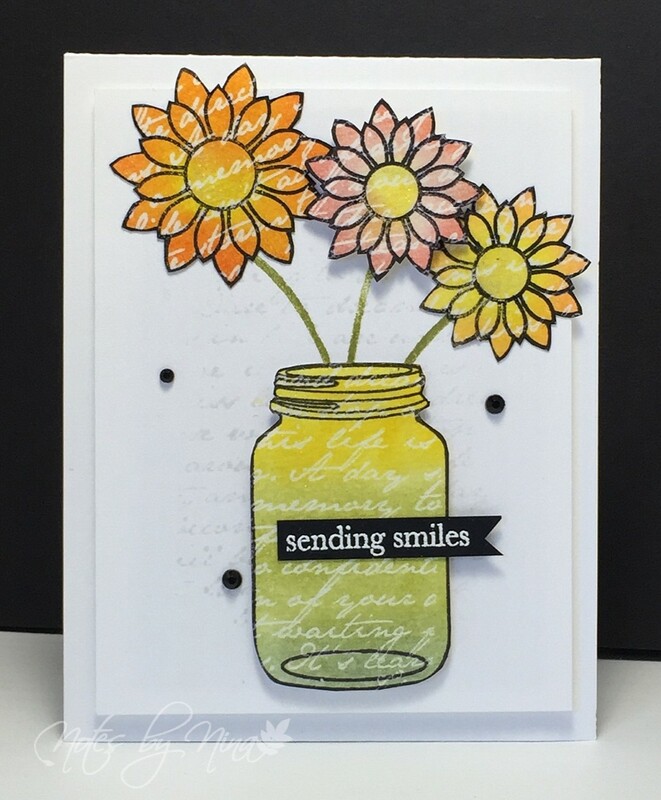 I love the little smiling faces on the flowers, I added a little shimmer to them with my Wink of Stella clear. I added a few pearls to the vase as well. Supplies: White card stock, Designer Paper - Simple Stories, Lawn Fawn - On the mend, pearls. Good Morning, I may have gone a step past CAS with my card but when creativity strikes go with it. Besides I could not ditch my sister as we were crafting together via chat. 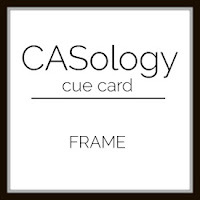 We are playing along with CASology. What a fun crafty week it has been, I have managed at least one card an evening so far, ok, I hear you it is only Wednesday but its a start. I covered the face of my card with these pretty papers. I had the frame already on my desk from a past project, I popped it up with foam tape. I die cut the butterflies first with DP then vellum, added a small piece of foam tape between and hiding it with the butterfly body. 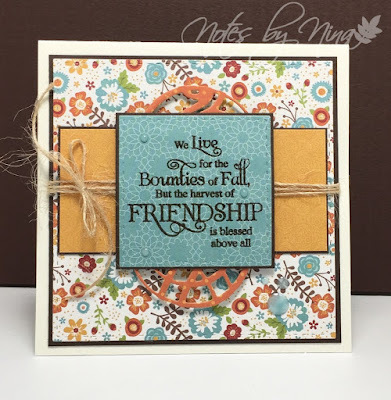 I added the heat embossed sentiment then finished with some Wink of Stella. 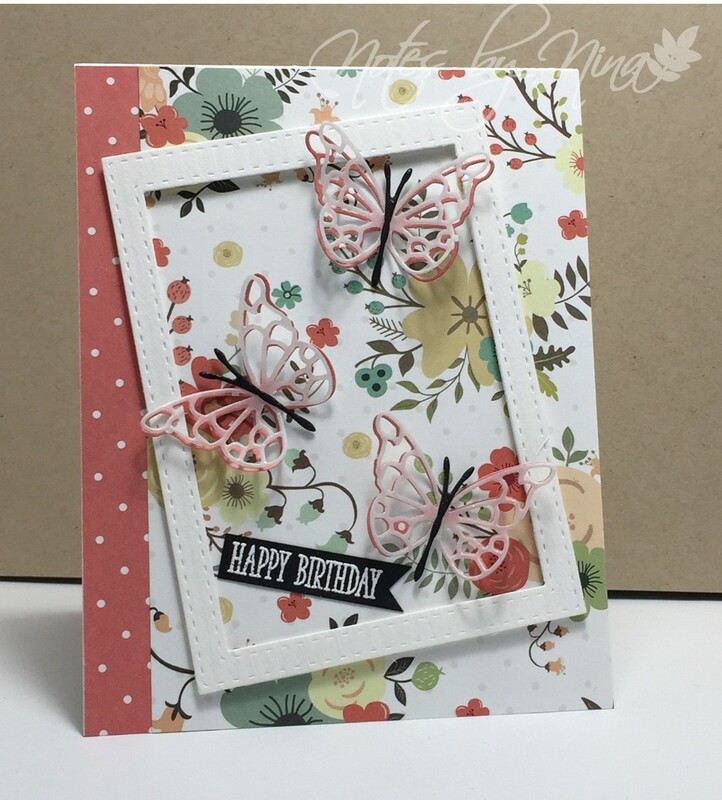 Supplies: White and black cardstock, Designer Paper - Teresa Collins, Clearly Besotted - Messages, SSS stitched die cuts, Memory Box - Rhone Butterfly Wings. 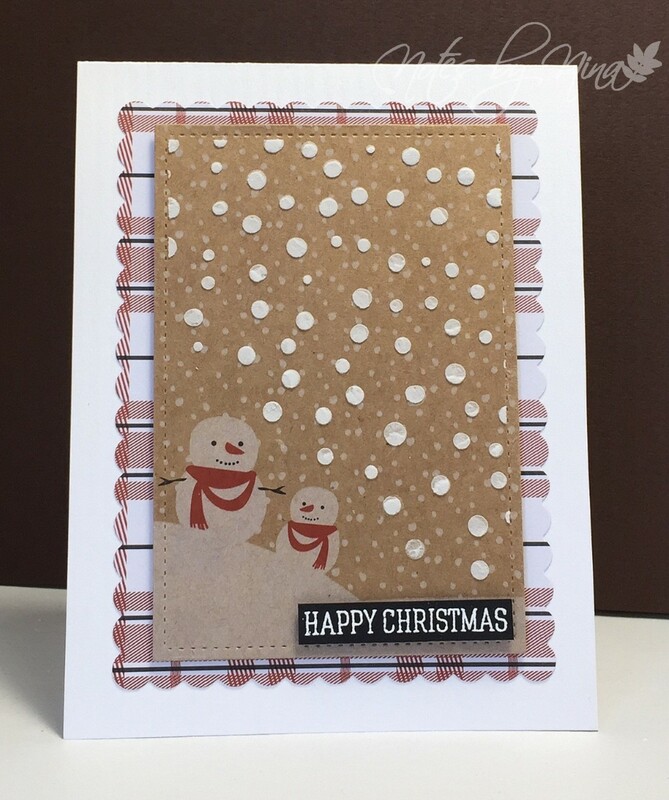 Wow the white on this designer paper really pops in this photo, it makes those brown stripe have a little va va voom :). 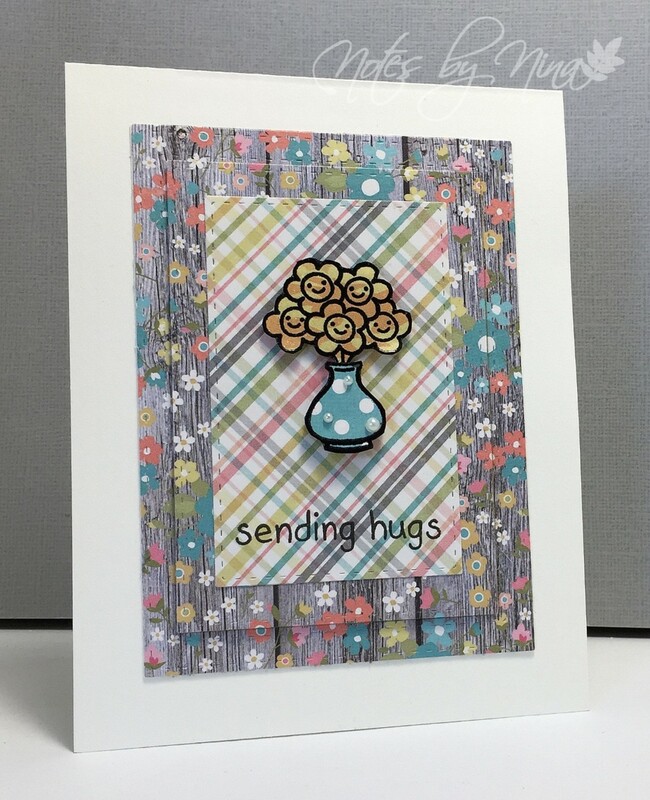 Just a quick card with my favorite.. layers. The bandaid is a couple layers deep with foam tape between, the center panel is also popped up. 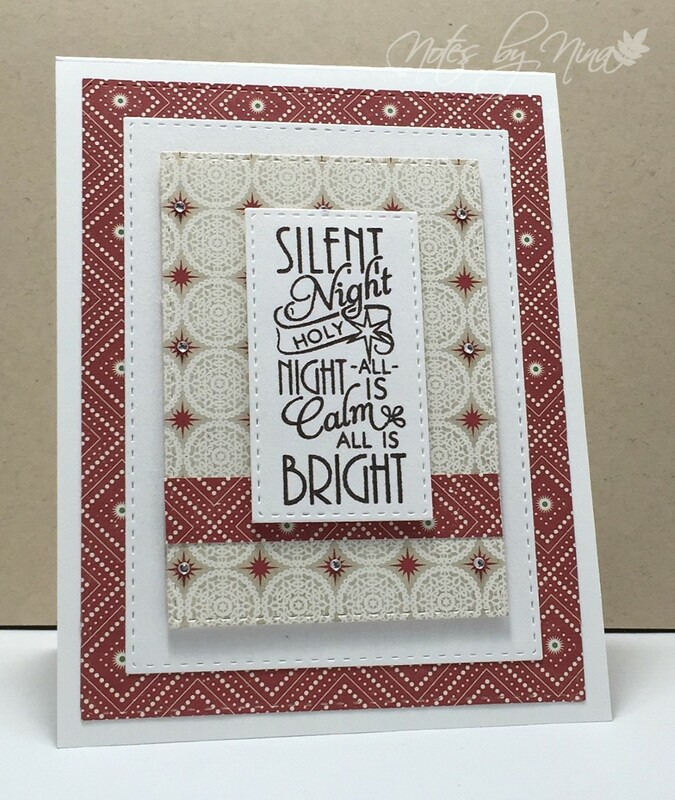 I heat embossed the sentiment and added some twine and woodgrain sequins to finish. Supplies: Kraft and brown cardstock, Designer Paper - Unknown, Lawn Fawn - On the mend, twine, sequins. I spent a little time in the craft room last evening, and it felt fabulous. Some days by the time I have finished work, made dinner, lunches for the next day and on and on I feel drained. My poor little craft supplies get sadly neglected and well nothing get created. It was one of those just get in there moments, a book in my ears and my sister on Google Hangouts - a little slice of heaven right there :). 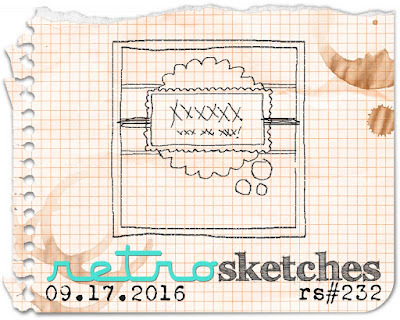 I am playing along with the current Retro Sketches challenge. Layers.. I love me some layers. I have this fun 6x6 Echo Park paper pad on my craft table right now that is full of fabulous fall prints. I pulled out one of the die cuts I received with my new little gold 'bug' , I had to trim down some of the loops as was too big for the square card. I added a thin brown matt to each layer, and heat embossed the sentiment. I finished with some twine and pale blue dots. 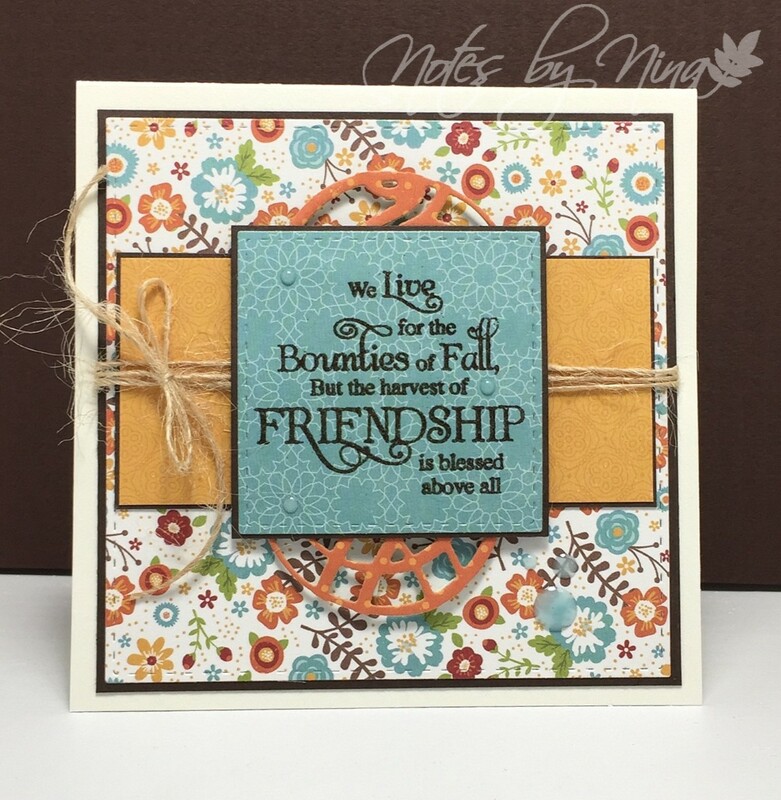 Supplies: Cream and brown card stock, Designer Paper - Echo Park, Just Rite - Shabby Chic Autumn Leaves, Anna Griffen - die cut, SSS stitched rectangles, twine, dots. Monday is here again and we have a new Merry Monday Christmas Card challenge for you. 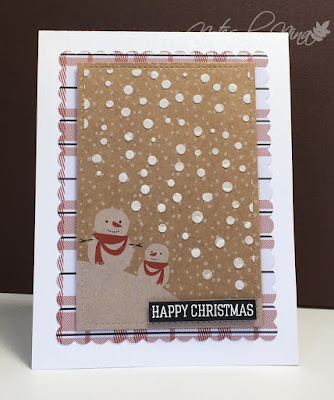 This week’s challenge is Create a Christmas card using something warm. The first thing that came to mind for me .. something to warm drink. I love when I am out snowshoeing and we stop for a snack and I have a wonderful cup of tea or hot chocolate as your breath puffs into the chilly air but your insides get all warm and cozy with each sip. 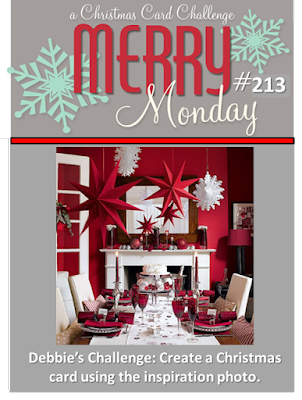 Supplies:White and red cardstock, Designer Paper - My Minds Eye, Fiskars - Simple Stick, The Alley Way Stamps - Breakfast Club. If you have not been there yet, head over the Merry Monday blog, take a look at all the wonderful inspiration and get your craft on. Good Morning and welcome to The Challenge, we are in week three for this month with a photo inspiration. 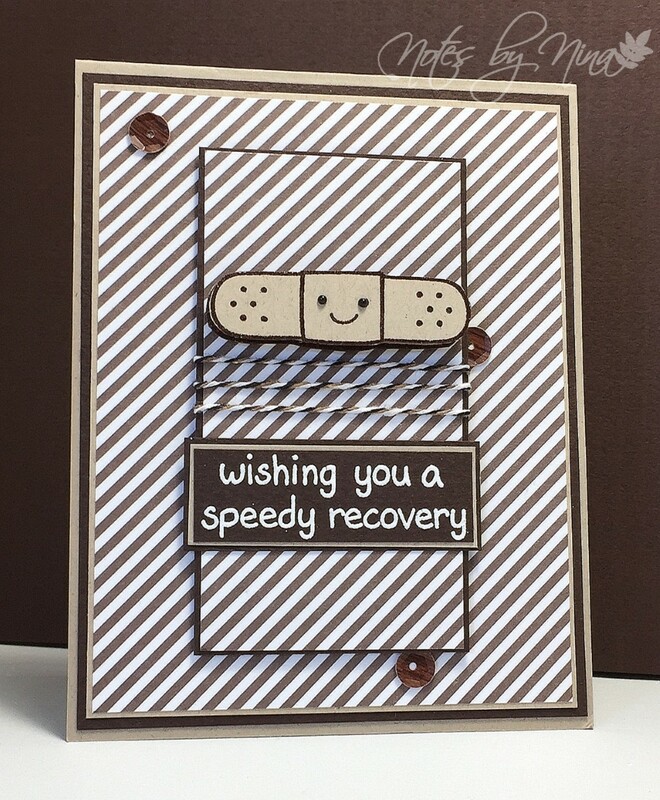 I made this card way more difficult that it needed to be :) but I seem to be getting my inspiration from techniques these past few weeks. So will some emboss resist and colour blending I was pretty happy with how my card turned out. I have these adorable little pineapple charms in my stash, I tried 3 times to make it work for this challenge before I gave up. My inspiration became the beautiful and bright flowers. Our local grocery store has some beautiful sunflowers for sale, I have loved having them on my counter so I wanted to try to recreate that for my card. 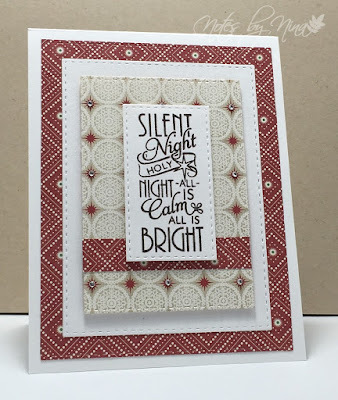 I started with heat embossing a panel of white cardstock, clear embossing powder and a script background. I then stamped the jar and flowers over top of that in archival ink and did some ink blending. I fussy cut the flowers and far out, the jar is popped up with foam tape as well as one of the flowers. I stamped the background panel with the same script stamp but in light grey and finished with some black gems. 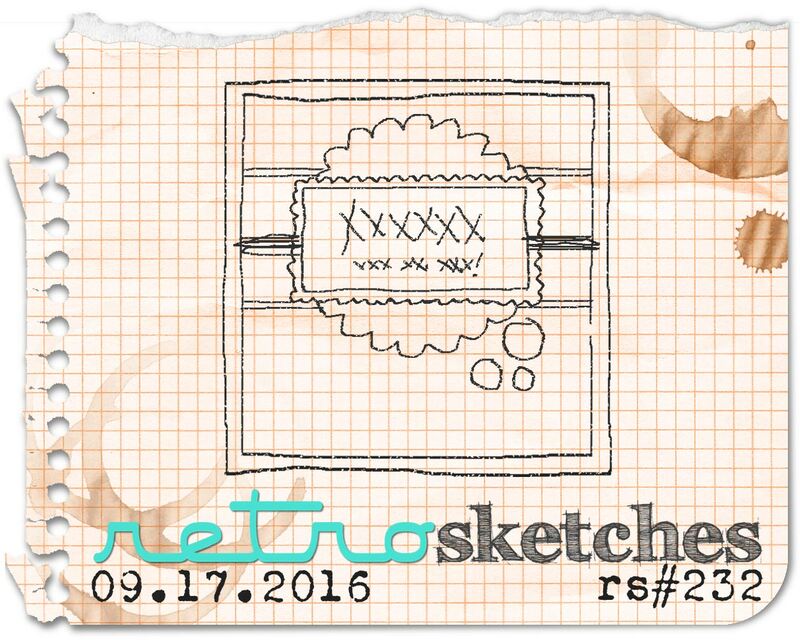 Supplies: White and black card stock, Kaiser Craft - Background Script. Verve - Lean on Me, Recollections, Jar, gems. Be sure to stop by The Challenge blog to play along, the Design Team has some wonderful inspiration to share. A huge Happy Birthday to my sister Barb. I hope you get cake :). Simple layouts have been something I have gravitated to lately, and this pretty DP made it so easy. I used stitched rectangles for the layers, I die cut the happy 3 times to give it some thickness. I glossed over the letters with my Spectrum clear pen for some glitter. Then finished with the Birthday flag and sequins. Supplies: White card stock, Designer Paper - My Mind's Eye, Hero Arts Stamp and cut - Happy, sequins. 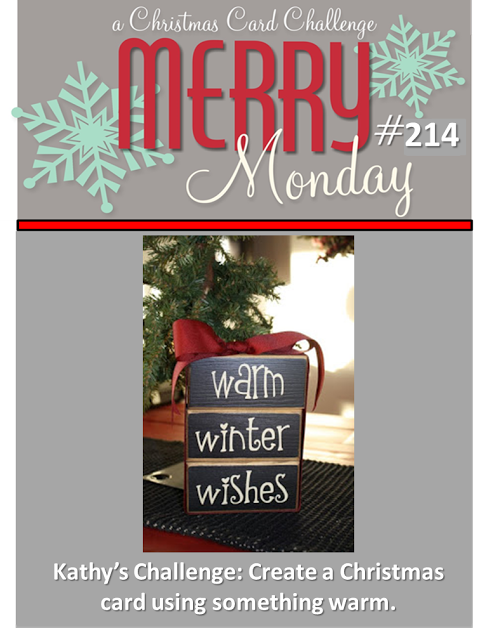 Merry Monday everyone, welcome to a new Merry Monday Christmas card challenge.. there are 103 days till Christmas, if you have not started your holiday card yet.. what are you waiting for. 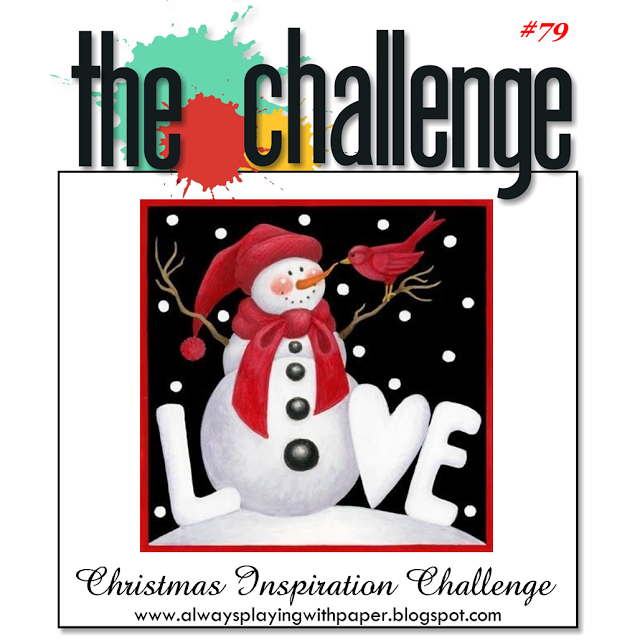 This week’s challenge from Debbie is to create a Christmas card using the inspiration image. This is such a beautiful image with so much inspiration. The first thing that caught my eyes was the colours, white, red, hints of cream or tan and tiny speck of green from the sprig of holly or mistletoe. So with all that in mind I dug through my paper pads till I found something that would work for me. I jumped in with layers, all cut out with my handy dandy stitched die cuts (yes… they are still a favorite). Although you can not see it so much I did layers of red and black inks for the sentiment and popped it up with foam tape. I finished with some gems. 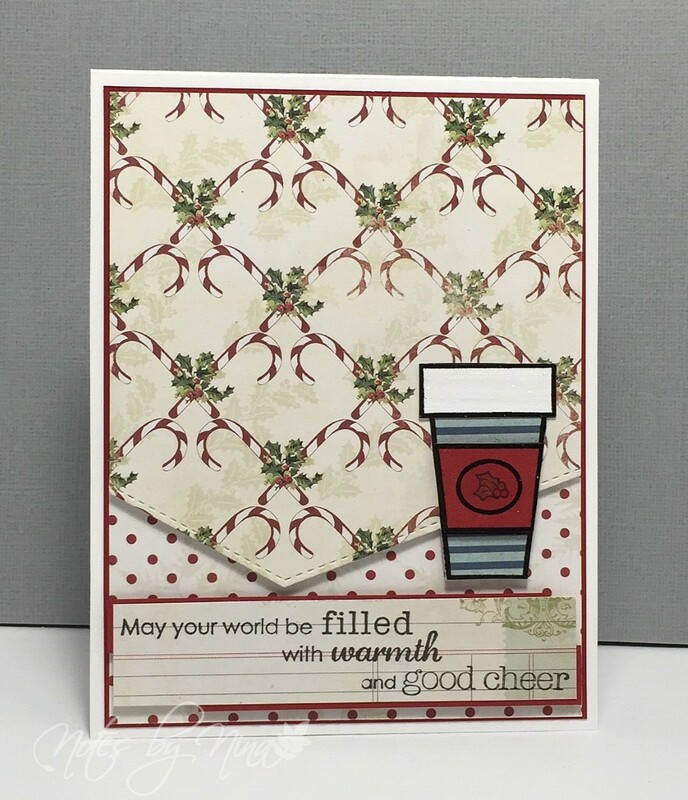 Supplies: White card stock, Designer Paper – Echo Park, Verve – Holiday Phrases, gems, SSS die cuts. The Merry Makers have tons of inspiration over on the blog, stop by take a look and be sure to leave a little love. Good Morning and happy Saturday – welcome to a new The Challenge. This week is a colour challenge. I have been watching lots of YouTube videos lately trying to get my mojo kicked into gear, and a technique I wanted to try was smooshing/smootching… something like that. 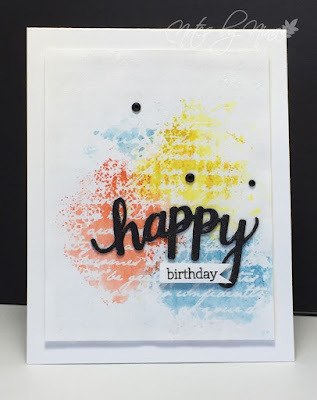 Anyway, Kristina Werner created this effect by laying colour down on her craft mat then putting down cardstock – I have tried that before and it only worked so so for me. This weekend though I watched Laura Bassen worked with a small piece of acetate so I thought I would try it. 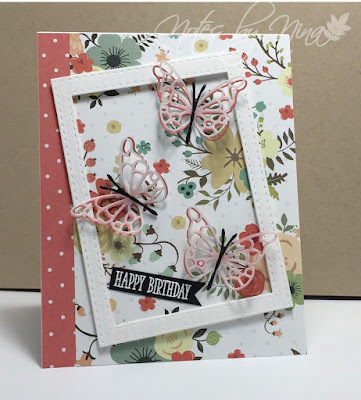 Her video is also the inspiration for my card along with the colour challenge. I am not sure if I was really happy with how this turned out, it is my second attempt. I could not just stay with the one technique either I had to try the emboss resist too, the background script stamp is new so I wanted to try it. I added colour then dabbed with a paper towel to remove any excess. I die cut the happy three times in back to give it dimension ( I won’t talk about my epic foam tape fail) and added a small white flag for the rest of the sentiment. I finished with some gems. 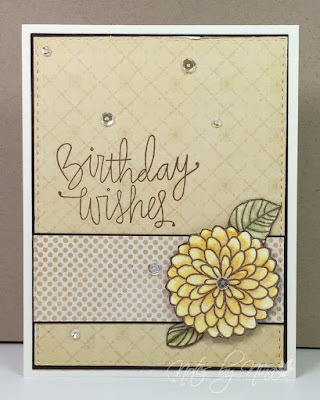 Supplies: White and black card stock, Kaiser Craft - Background Script, Hero Arts - Happy stamps and cut, gems. 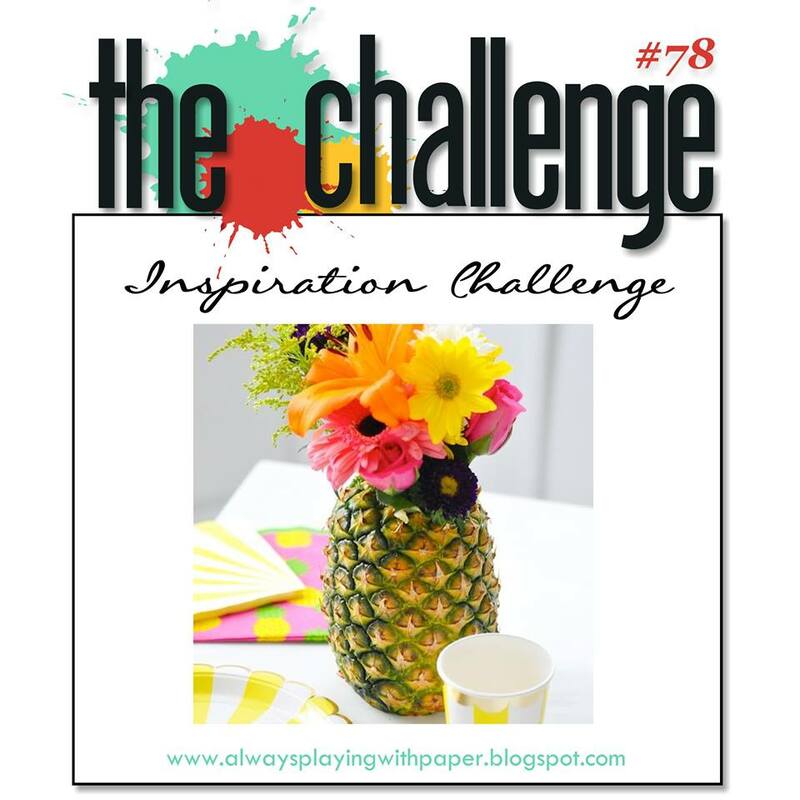 Be sure to stop by The Challenge blog for all the details and see some amazing inspiration. Play along with us. Good Morning and well come back to the first Merry Monday after our summer break. I hope everyone had a fantastic summer. I did not get as much card making done over the break as I had hoped but I did change my craft space into a craft room which I am very happy with. 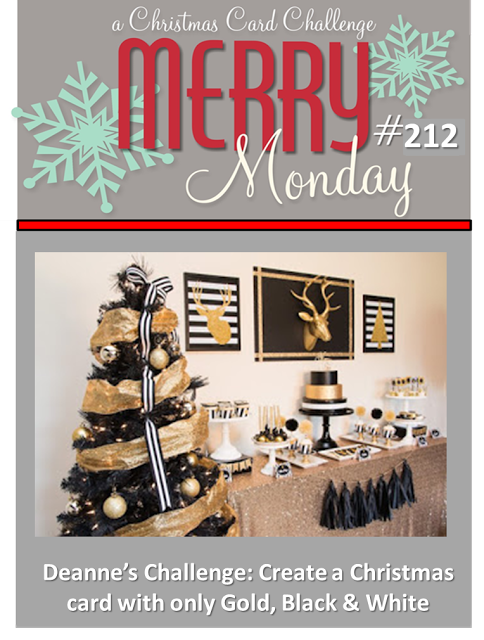 This week’s challenge is to use white, gold and black on your Christmas card. 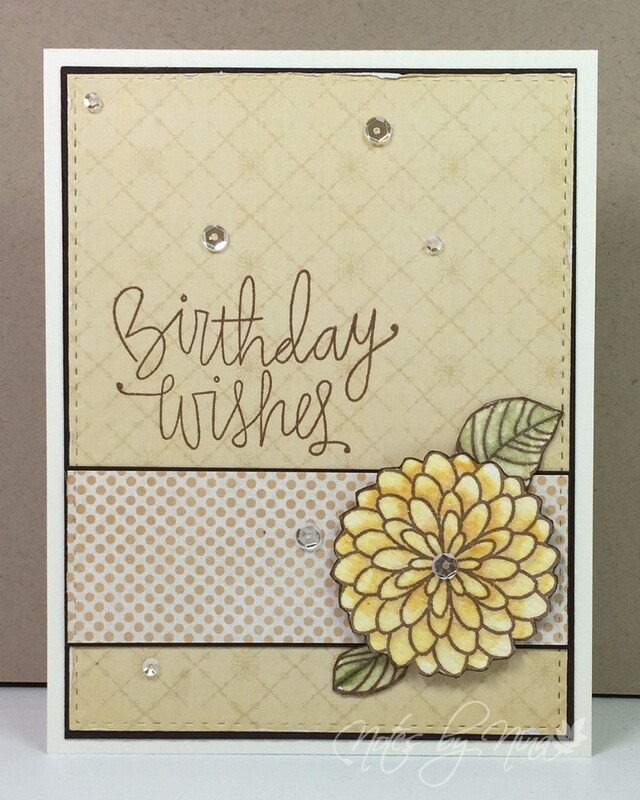 I created the gold polka dot panel with my Minc, I used lots of layers for my card. The stitched die cuts added a nice element to layers. I was not going to add the top rectangle on the lower half of my card but truthfully it is covering a boo boo made as I was trying to fill in one of the dots that was not quite gold. I die cut the sentiment multiple times to add dimension then finished with some sequins. 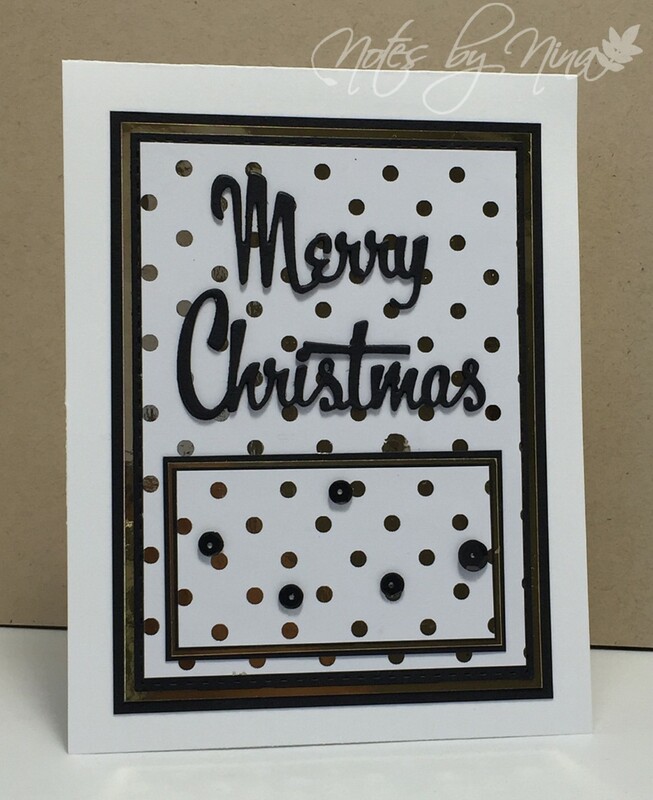 Supplies: White, black and gold card stock, Designer Paper – Hiedi Swapp(Minc), Dee’s Distinctly – Merry Christmas, sequins, SSS – stitched rectangles. 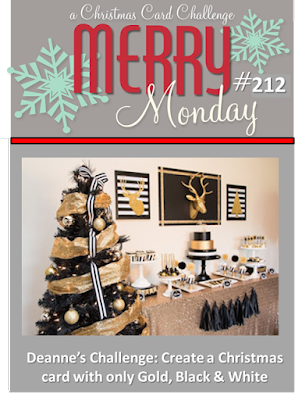 Be sure to stop by the Merry Monday blog to see what the Merry Makers have created for inspiration. We love comments to :). Happy Saturday and welcome back! We are changing it up for The Challenge moving forward. We will now post on Saturdays, lots of weekend crafty time to join in the fun. Can you believe it is September, the summer just disappeared. I love this clean layout, I have been favoring these styles over the past few months. 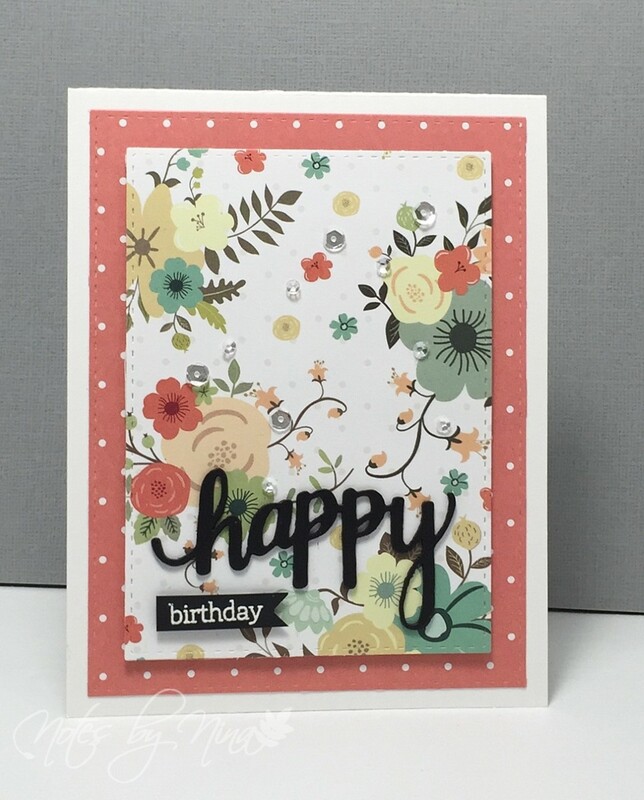 I used patterned paper for the layers, adding a thin brown mat. I stamped and fussy cut the flower and leaves, they are covered in a thin coating of shimmer courtesy of some new Spectrum markers. I also popped them up with some foam tape for some dimension. I finished with this whimsical font for the sentiment and some clear sequins. Be sure to stop by The Challenge blog to take a look at all the wonderful inspiration that Design Team had created. Play along with us. Supplies: Cream and brown cardstock, Designer Paper - My Minds Eye, Simon Says - Birthday Bits and Handwritten Floral Greetings, sequins. I live in beautiful British Columbia, Canada. This blog is a journal of sorts as I learn more about the craft I love - cardmaking. Background created using Besida Pattern, Font Jenna Sue, and Brushes by GValkrie. Picture Window theme. Powered by Blogger.